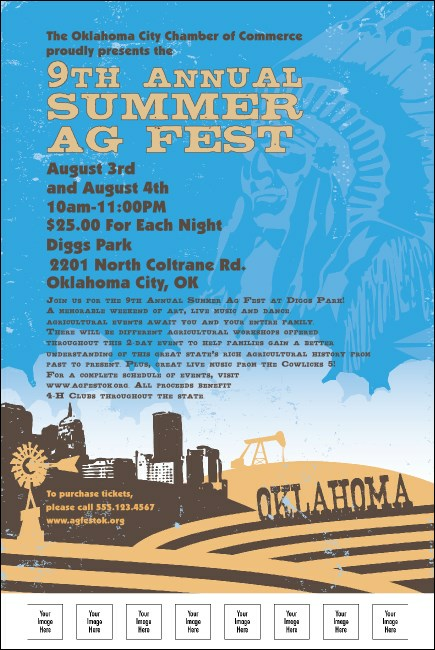 For a promotion as big as the bright, blue skies of the Sooner State, choose the Oklahoma Poster. With the state flag flying proudly over golden wheat fields, and the image of a city skyline rising up above the plains, this poster template has space for eight photos or logos of your own. Promote your event from Tulsa to Oklahoma City with a Matching Kit from TicketPrinting.com.